Comics artist Josh Medors (Frazetta’s Swamp Demon & Sorcerer, Runes of Ragnan, 30 Days of Night) has cancer in his spinal column. To help offset some of his medical bills, The Hero Initiative has released 250 individually numbered prints featuring Medors’ recreation of the Amazing Spider-Man #33 cover by Steve Ditko signed by Medors and Stan Lee. The Hero Initiative is a not-for-profit corporation which helps comic book creators who may need emergency medical aid, financial support for essentials of life, or an avenue back into paying work. Artist Josh Medors continues to battle against a rare form of cancer in his spinal column. And Spider-Man’s coming to help save the day. 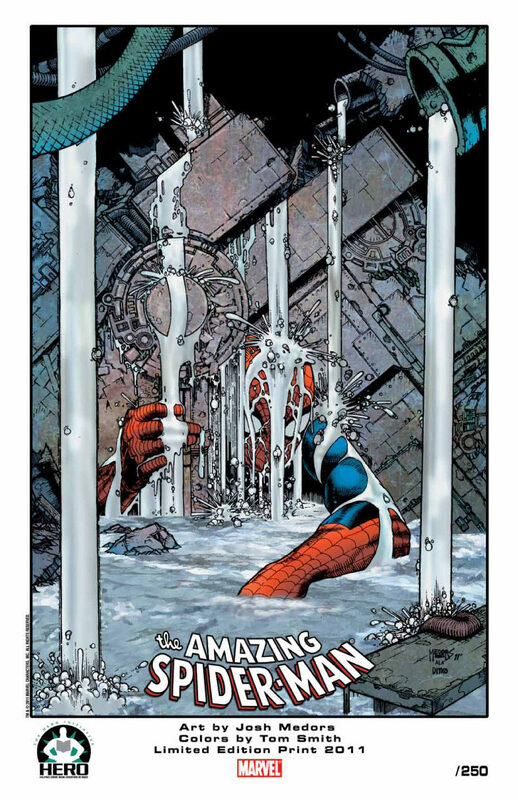 The Hero Initiative in conjunction with Marvel Comics has created a limited edition print featuring Josh Medors’ recreation of the classic Amazing Spider-Man #33 cover by Steve Ditko. Proceeds from sales of the print, available at Medors’ hometown comic store, Packrat Comics of Hilliard, Ohio, will go directly to Josh to offset medical expenses. Only 250 individually numbered prints will be available. Of these, 50 will be autographed by both Medors and Spider-Man co-creator Stan Lee at $100 each. The remaining 200 will come autographed by Medors alone at $20 each. Prints will go on sale on Free Comic Book Day, May 7, 2011 at Packrat Comics, and will also be available at PackRatComics.com.